1993: Jacques Rougeau met Pierre Ouelette in Puerto Rico and they debuted in the WWF as the Quebecers. July 24, 1993 – Superstars: The Quebecers defeated Rich Myers and Tony Webb. August 1, 1993 – Wrestling Challenge: The Quebecers defeated Joey Maggs and Tony DiMiro. August 15, 1993 – Wrestling Challenge: The Quebecers defeated Mike Bucci and Mike Maraldo. August 21, 1993 – Superstars: The Quebecers defeated Dan Dubiel and Scott Despres. September 4, 1993 – Superstars: The Quebecers defeated Aaron Ferguson and Mike Khoury. September 6, 1993 – RAW: The Quebecers (Jacques and Pierre) defeated Duane Gill and Barry Hardy. September 13, 1993: The Quebecers defeated The Steiner Brothers by disqualification to win the Tag Team titles. ~~~The Quebecers stated that the match would be fought under “Canadian” rules, so the titles changed hands! September 20, 1993 – RAW: Scott Steiner defeated Quebecer Pierre..
September 27, 1993 – RAW: The Quebecers defeated The 1-2-3 Kid and Barry Horowitz to retain the Tag Team titles. October 31, 1993 – Wrestling Challenge: Men on a Mission defeated The Quebecers by count-out. December 11, 1993 – Superstars: The Quebecers defeated Chaz Ware and Paul Jones. December 19, 1993 – Wrestling Challenge: The Quebecers defeated Mark Thomas and Virgil. January 10, 1994 – RAW: Marty Jannetty and 1-2-3 Kid defeated The Quebecers for the Tag Team titles. January 17, 1994 – RAW: The Quebecers defeated Marty Jannetty and 1-2-3 Kid to recapture the Tag Team titles. January 22, 1994 – Royal Rumble: The Quebecers defeated Bret and Owen Hart to retain their titles. February 5, 1994 – Superstars: The Quebecers vs. The Steiner Brothers ended in a time limit draw. February 20, 1994 – Wrestling Challenge: The Quebecers defeated Phil Apollo and Tim McNeany. February 21, 1994 – RAW: Razor Ramon and The 1-2-3 Kid defeated The Quebecers by disqualification. February 26, 1994 – Superstars: The Quebecers defeated John Paul and Miguel Rosado. March 13, 1994 – Wrestling Challenge: The Quebecers defeated Rich Myers and Steve Smyth. March 20, 1994 – WrestleMania X: Men on a Mission beat The Quebecers by count out. The Quebecers retains the tag titles. March 21, 1994 – RAW: The Quebecers defeated The Bushwhackers. March 29, 1994 – House Show: Men on a Mission defeated The Quebecers to win the tag team titles. 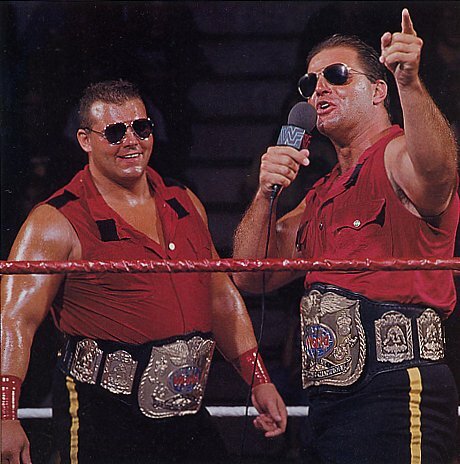 March 31, 1994 – House Show: The Quebecers defeated Men on a Mission to win the tag team titles. April 11, 1994 – RAW: The Quebecers defeated Men on a Mission (Mabel and Mo). April 17, 1994 – Wrestling Challenge: The Quebecers defeated Trey Conveyer and Virgil. April 24, 1994 – Superstars: The Quebecers defeated Ben Jordan and Scott Taylor. May 1, 1994 – Wrestling Challenge: The Quebecers defeated Gus Kantarakis and Scott Taylor. May 2, 1994 – RAW: The Quebecers defeated The Headshrinkers (Fatu and Samu). May 29, 1994 – Wrestling Challenge: The Quebecers defeated Paul Van Dale and Steve King. June 4, 1994 – Superstars: The Quebecers defeated Tim McNeany and Tony Roy. ~~~After the match, Pierre Ouellet and Johnny Polo (aka Raven) turned on Jacques Rougeau. ~~~Raymond Rougeau then ran down to the ring to save his brother – reuniting the Rougeaus. October 21, 1994 – Jacques Rougeau Retirement Show: Jacques Rougeau defeated Pierre Ouellet in the main event. Jacques Rougeau left the business, but came back with WCW with Ouelette as the “Amazing French Canadians”. ~~~they were managed by Col. Robert Parker (who began dressing in a French Foreign Legion uniform). September 9, 1996 – WCW Monday NITRO: The Nasty Boys (Knobbs and Sags) defeated The Amazing French Canadians. September 21, 1996 – Saturday Night: Amazing French Canadians defeated Scott and Steve Armstrong. October 28, 1996 – WCW Monday NITRO: The Amazing French Canadians vs. High Voltage ended in a No Contest. November 9, 1996 – Saturday Night: The Amazing French Canadians defeated Harlem Heat by count-out. November 11, 1996 – WCW Monday NITRO: The Amazing French Canadians vs. Harlem Heat ended in a No Contest. November 16, 1996 – Saturday Night: The Amazing French Canadians defeated Bobby Eaton and Chavo Guerrero Jr..
November 18, 1996 – WCW Monday NITRO: The Amazing French Canadians beat The American Males. November 23, 1996 – Saturday Night: The Amazing French Canadians defeated Mark Starr and Casey Thompson. November 24, 1996 – WCW World War III: Harlem Heat defeated The Amazing French Canadians. Stipulation was that if Harlem Heat won then Sister Sherri would get 3 minutes with Parker. Both Quebecers members also participated in the 3 ring battle royal won by The Giant. December 2, 1996 – WCW Monday NITRO: The Amazing French Canadians defeated The Renegade and Joe Gomez. December 7, 1996 – Saturday Night: The Amazing French Canadians defeated Steve and Scott Armstrong. December 23, 1996 – WCW Monday NITRO: The Amazing French Canadians defeated Public Enemy by disqualification. December 30, 1996 – WCW Monday NITRO: The Amazing French Canadians defeated Public Enemy. January 6, 1997 – WCW Monday NITRO: Harlem Heat defeated The Amazing French Canadians. January 11, 1997 – Saturday Night: Harlem Heat defeated The Amazing French Canadians. January 20, 1997 – WCW Monday NITRO: Lord Steve Regal defeated Jacques Rogeau. January 21, 1997 – Clash of the Champions: Steiner Brothers defeated The Amazing French Canadians. January 27, 1997 – WCW Monday NITRO: Arn Anderson (final match) and Mongo McMichael defeated The Amazing French Canadians. February 1, 1997 – Saturday Night: The Amazing French Canadians defeated High Voltage. February 17, 1997 – WCW Monday NITRO: Public Enemy defeated The Amazing French Canadians. March 1, 1997 – Saturday Night: Public Enemy defeated The Amazing French Canadians by disqualification. March 10, 1997 – WCW Monday NITRO: Lex Luger, The Giant and The Steiners defeated Greg Valentine, Roadblock and The Amazing French Canadians. March 31, 1997 – WCW Monday NITRO: The Amazing French Canadians defeated Jeff Jarrett and Steve McMichael. April 13, 1997 – Worldwide: The Faces of Fear defeated The Amazing French Canadians. April 28, 1997 – WCW Monday NITRO: Lex Luger and The Giant defeated The Amazing French Canadians. June 16, 1997 – WCW Monday NITRO: Harlem Heat (Booker T and Stevie Ray) defeated The Amazing French Canadians. August 2, 1997 – Worldwide: The Amazing French Canadians defeated High Voltage. 1998: The Quebecers (Jacques Rougeau and Pierre Ouelette) were both rehired. January 19, 1998 – RAW IS WAR: The Quebecers defeated Cactus Jack and Chainsaw Charlie by disqualification. January 26, 1998 – RAW IS WAR: The Quebecers defeated The Headbangers. February 3, 1998 – RAW IS WAR: The Godwinns defeated The Quebecers by disqualification. February 7, 1998 – Shotgun Saturday Night: Los Boricuas (Jose Estrada & Miguel Perez) defeated The Quebecers (Jacques & Pierre). February 15, 1998 – No Way Out: The Godwinn Cousins defeated The Quebecers. February 16, 1998 – RAW IS WAR: The Quebecers defeated The Legion of Doom by count-out. February 28, 1998 – Shotgun Saturday Night: The Disciples Of Apocalypse (8-Ball & Skull) defeated The Quebecers (Jacques & Pierre). March 3, 1998 – RAW: Cactus Jack and Chainsaw Charlie defeated The Quebecers. March 17, 1998 – RAW: Cactus Jack and Chainsaw Charlie defeated The Quebecers by disqualification. March 29, 1998 – WrestleMania XIV: The Quebecers competed in a Tag-Team Battle Royal which was won by the LOD 2000. April 4, 1998 – Shotgun Saturday Night: The Quebecers and Ray Rougeau defeated Adam Copeland, Shawn Stasiak ad Tom Brandi in a dark match. April 13, 1998 – RAW: Terry Funk and Too Cold Scorpio defeated The Quebecers. April 18, 1998 – Shotgun Saturday Night: The Quebecers vs. The Headbangers ended in a double disqualification. April 25, 1998 – Shotgun Saturday Night: The Quebecers defeated Armageddon (Poirier and Buchanan). August 2, 1998 – House Show: Tag team champions The New Age Outlaws defeated The Quebecers and Mark Henry and The Godfather in a 3-way tag team match to retain the titles. Jacques Rougeau and Carl Ouelette were briefly members of WCW’s Team Canada, headed by Lance Storm.